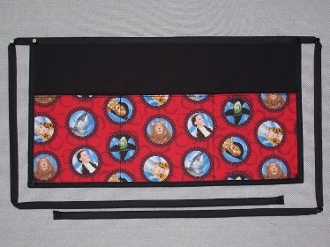 Fancy Aprons LLC - Wizard of Oz, waiter apron. Novelty Prints, one of our 20 plus apron categories, featuring over 250 colorful 3 pocket waitress, waiter apron designs. Welcome to our store... All 3 pocket designer waitress, waiter aprons also known as server, waist and half aprons are handmade using double layered cotton and poly-cotton blend materials. Stitching includes reinforced bar tacking starting ABOVE the pocket, at the bottom of the pocket and at the band stress points. Overall band length, 82 inches. Apron dimensions: 22 inches wide by 11 ½ inches tall, pocket depth 7 ½ inches. All 3 pockets will accommodate the black books. Thread used is 100% polyester. For those of you new to Fancy Aprons, we warranty our product. If you have a problem with one of our aprons, we want to know about it. Simply e-mail or contact us using the toll free number. Florida residents add sales tax. Every package mailed with delivery conformation. ***Buy 12 or more (any combination) FREE SHIPPING! (Excludes Canada). We accept all major credit cards or Paypal if you prefer. Copyright © 2008-2019 Fancy Aprons LLC. All rights reserved.